Home » Articles » Part 1: Meta Trader 4 Show – What is Meta Trader 4? I’ve decided that I’m going to be adding some articles about a software called Meta Trader 4 as a show. Keep on reading, because you’ll learn what Meta Trader 4 is, how to use it and what can actually be done with it. So, let’s get to work! What is Meta Trader 4? 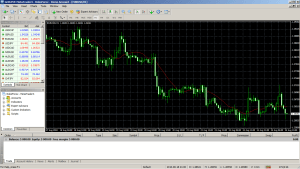 Meta Trader 4 (or MT4) is a trading platform developed by a MetaQuotes Software company for online forex trading. It allows the user to very closely monitor prices and market developments in charts, receive various alerts, set up indicators and also trade directly. MT4 could seem a little confusing, unnecessary and fussy in the beginning, but believe me, everyone, after a short while, can learn how to operate it and use it to trade. Due to its great popularity on the internet, various extensions can be found that will help us trade (called indicators and expert advisors) and even I’ve been using them with great, long-term profits. The best part is that Meta Trader 4 program is available completely free of charge on the official website. You can find loads of indicators online. Most of them will promise you endless profits, but they are often paid and usually don’t work. That is why we’ll be talking about those indicators, that are free of charge and actually do work, in our Technical Analysis Show.